Lupita Tovar (July 27, 1910 – November 12, 2016) was a Mexican-American silent movie actress. She was known for her role in the 1931 Spanish version of Dracula. Tovar was born on July 27, 1910 in Matías Romero, Oaxaca, Mexico. She began acting and was raised in Mexico City, Mexico. Tovar was married to Paul Kohner from 1932 until his death in 1988. They had a daughter, Susan Kohner. Tovar died on November 12, 2016 at her home in Los Angeles, California of heart disease, aged 106. 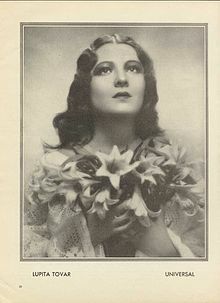 ↑ "Lupita Tovar, protagonista de la primera película del cine sonoro mexicano, fallece a los 106 años - Noroeste". www.noroeste.com.mx. This page was last changed on 15 February 2019, at 13:25.